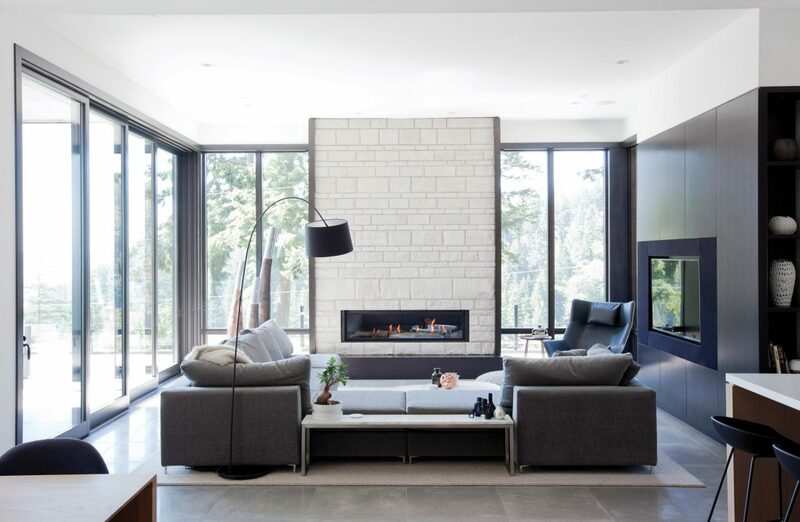 When Rachelle Chambers is asked about what part of her West Vancouver house she likes the best, she pauses to reflect on her answer. After a lengthy silence, having given the query careful consideration, she offers a one-word answer in an even, understated tone: “Everything,” she says. She is not being trite, nor is she generalizing. 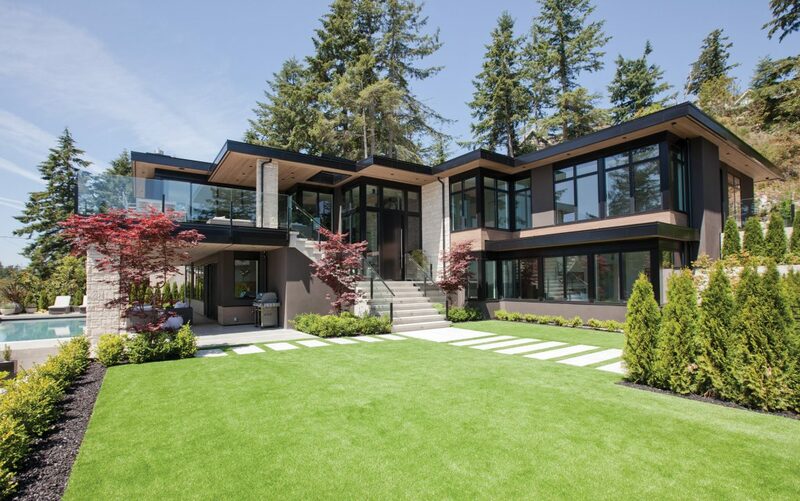 If we were to expand on her answer and describe this West Coast Contemporary two-storey home in two words, the choice would be “stunningly spectacular” – and that would cover both the interior and exterior. The sprawling structure was created by residential designer Craig Chevalier of Craig Chevalier Custom Home Designs. 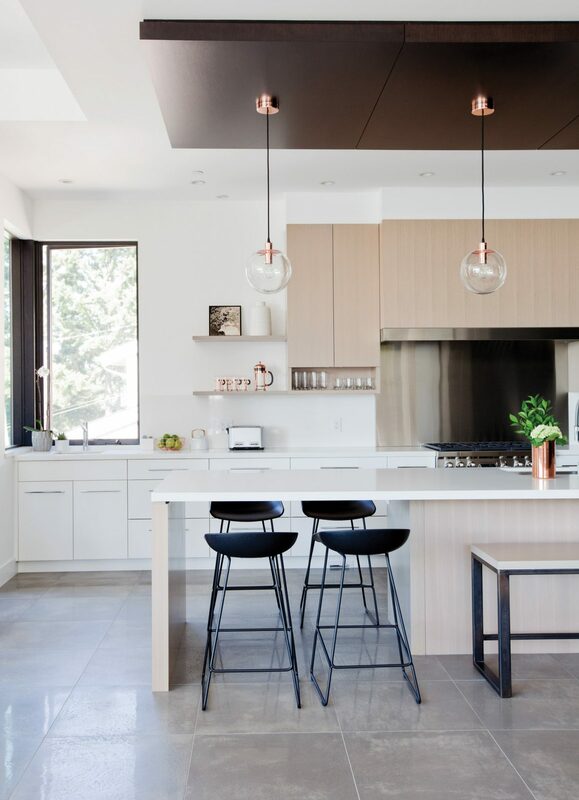 Dark millwork creates a canopy over the kitchen’s island, which is clad in Caesarstone quartz with a waterfall edge. The remaining cabinetry is light-stained white oak or white-lacquered MDF. 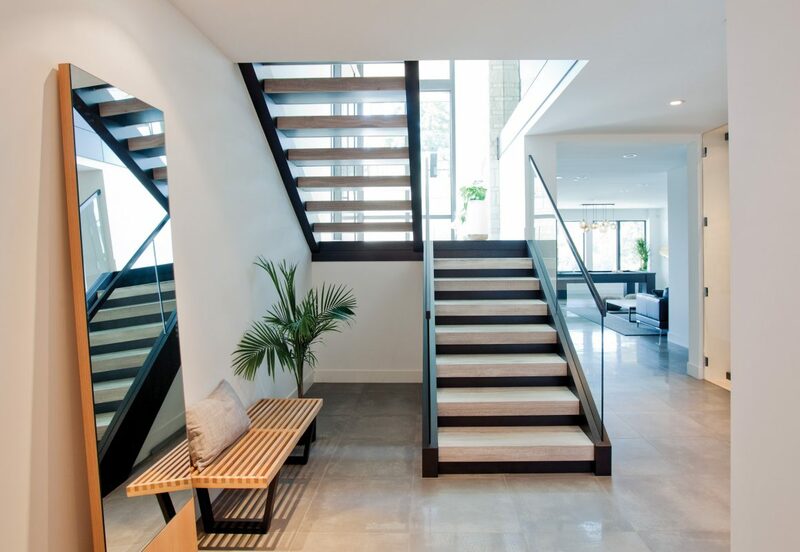 Rachelle, an interior designer with Chambers and Stark Design Studio, selected all the exterior finishes and handled all the interior details. The house is located just north of Burrard Inlet, near Lighthouse Park. The main objective of the design was to maximize the view of the water, Chevalier explains. “The view, the view, the view. How do we get the view? That was number one,” he says, adding that when he first visited the lot, it included an old summer cottage, which had a glimpse of the water only from a cramped bedroom on the top floor. The master bedroom enjoys a view of the water from the bed. It has a fireplace with a marble surround and a custom-made headboard with floating bedside tables. “Now, every room – from the lower level and the top level – has a view,” he says, which includes an ever-changing vista of ocean-going vessels making their way toward the Lions Gate Bridge. “It’s the gateway to the city’s harbour. Any cruise ship that comes in, you would see them all,” Chevalier adds. And it can be viewed from every room in the house, including by those lying in bed in the master bedroom or relaxing in the backyard swimming pool. The master bathroom features a shower with a herring-bone floor design and a tub with a view. 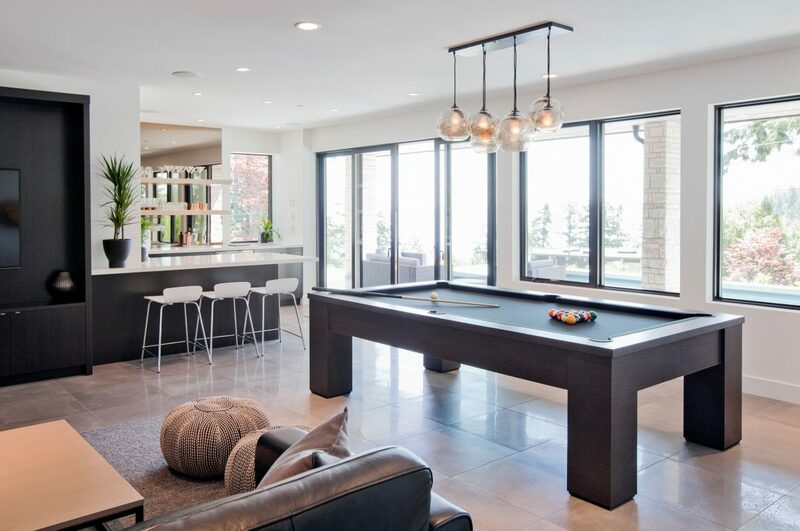 To achieve this, Chevalier designed what he calls “a reverse plan,” in which all the main living spaces – the kitchen, dining area, living room and master bedroom – are on the upper level, while the billiards room, home-theatre space, bar area and guest bedrooms are on the lower floor, which is at ground level and gives access to the pool. There is no basement. 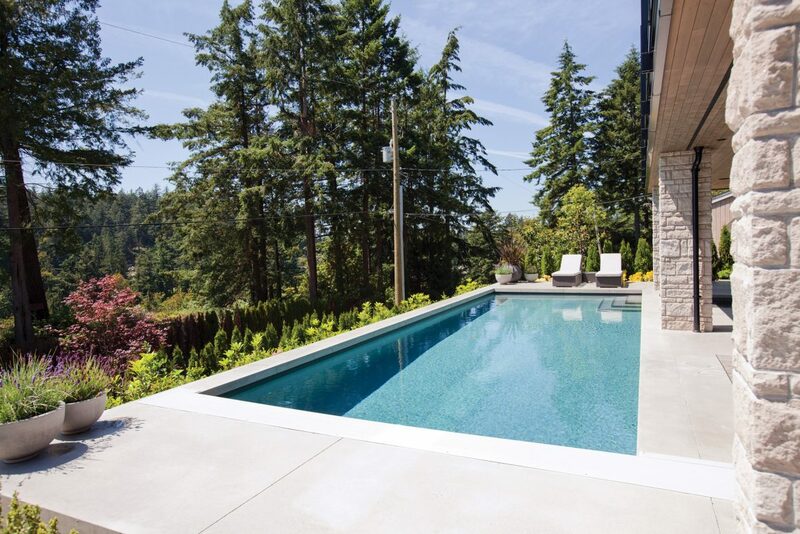 From the outside, the home is built into the jagged, sloped lot where a series of tiered levels curate the expansive landscaping that complements what Chevalier describes as a “saw-toothed” design. “I don’t do boxes,” he says, as he highlights the structure’s strong horizontal lines, stonework and extensive use of glass. “It is a big house but it works well with the topography of the property,” Rachelle adds. Sofas on the lower level face a wide-screen television with surround sound, the billiards area, and a bar that is equipped with a sink, refrigerator and dishwasher. The automobile is a 1959 Mercedes Benz 300D, which is on display in the house. Dubbed the Adenauer, the car was named after former chancellor of the German republic, Konrad Adenauer, who regularly travelled in custom versions of it during his tenure from 1949 to 1963. 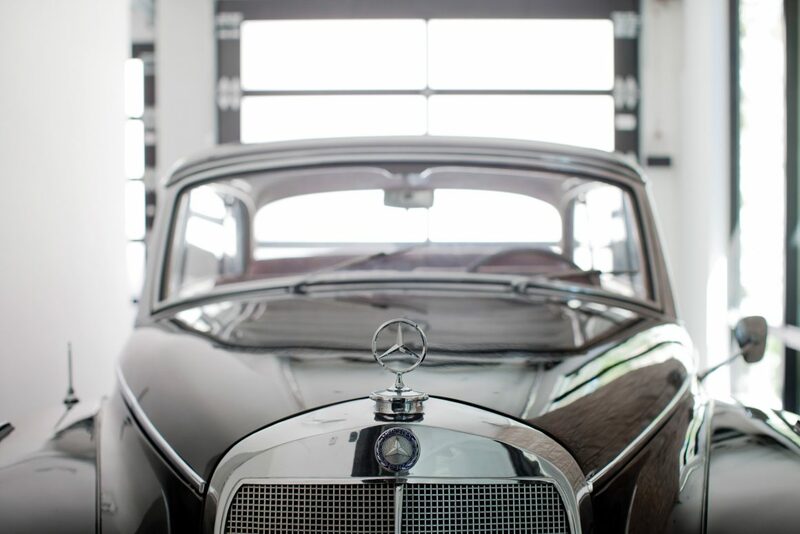 It was the largest Mercedes built during the 1950s. Finding a way to display the vehicle was key for the owners, says Chevalier. 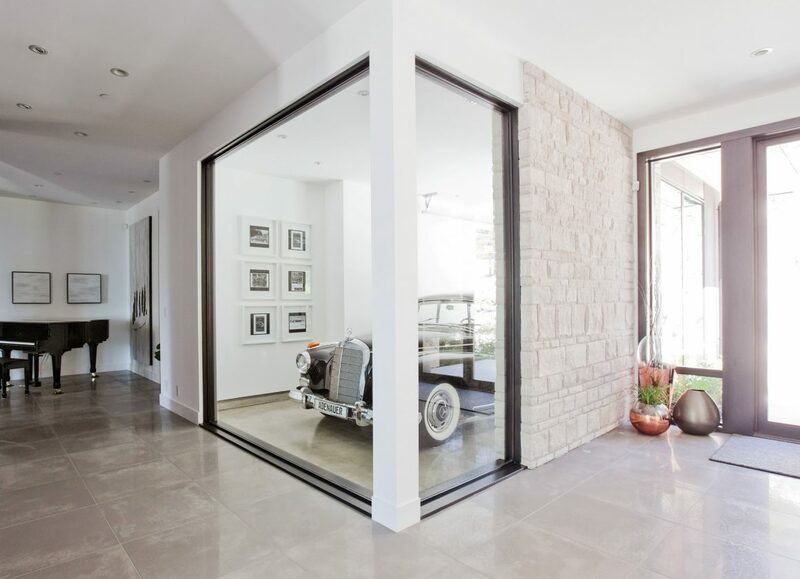 The entrance next to the customized garage bay that was specifically designed with both interior and exterior glass walls showcases the couple’s prized 1959 Mercedes Benz 300D. It’s not your typical collector’s car, Rachelle says, explaining that her German boyfriend had originally wanted to put it in the living room. “I said ‘no,’ ” she says. But together, along with Chevalier, they came up with the compromise of showcasing it in a uniquely designed garage bay with a glassed wall so that it is prominently displayed near the front entrance of the house. “It was a good location in that you wouldn’t see it all the time, but everyone who came into the house would see it,” Rachelle says. 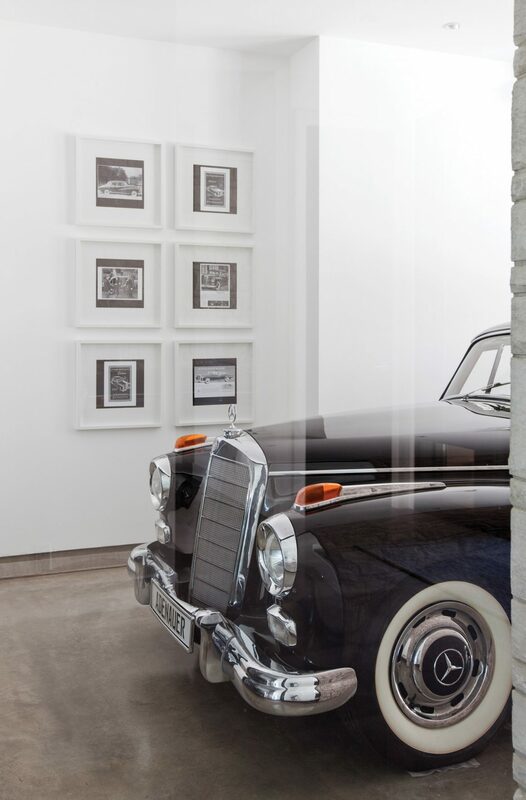 Inside the garage are framed photographs of the car, including an image of Konrad Adenauer in the same model, and vintage ads for the famous Benz. 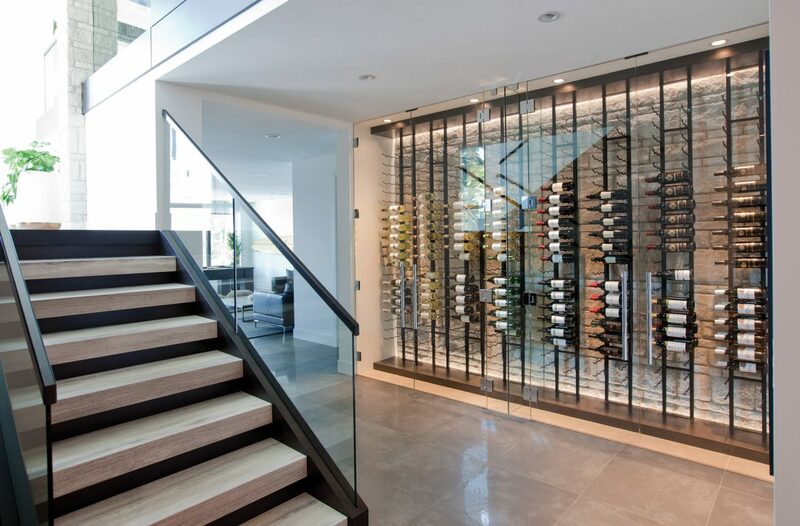 Another feature showcased by the unique split-level entrance that opens to a half flight of stairs to the main level and a half flight to the lower level is a stunning illuminated wine cellar. With a 500-bottle capacity, the custom-built floor-to-ceiling case fronts a limestone wall and the same white oak millwork finished in an almost black stain that is found throughout the home. These two unique features “make it kind of interesting when guests walk in,” Rachelle says. Custom-stained cedar, walls of windows, Indiana limestone, strong horizontal lines and a tiered landscape are combined to place this large house very comfortably on its sloped lot. Large floor-to-ceiling windows, walls finished in Indiana limestone and dark millwork, dominate the space. “I really wanted it to feel West Coast – where the beach meets the forest,” Rachelle says. “It’s contemporary that is warm and inviting, inspired by the ocean and the environment. It was an open canvas to pick whatever I like.